TICO Mini Bricks. The New Tiny Kid on the Block. During my recent trip to Taiwan, I came across a new line of micro brick construction toys called TICO. It appears to be a Taiwan made clone brand of the Japanese brand Nanoblock at only half the price. 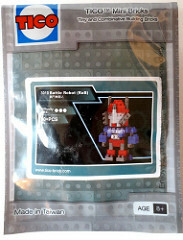 I bought a set, #3010 Battle Robot (RxB) for NT$180, which comes out to a little more than $6 US for around 80 pieces. The elements are very tiny and are rather difficult to handle, requiring a great deal of fine motor control. The instructions are straight forward, however, they use a technique of hi-lighting the pieces used in the current step by showing the pieces a shade lighter. This is a problem when the set includes 2 shades of grey, creating confusion as to which shade of grey is needed at which step. Secondly, the elements have no way of locking the studs of a connecting element on the long axis of an element, allowing the element on the underside to slide around. This creates a lot of play in the construction, making it somewhat difficult to line pieces up correctly. The final model is very loose and fragile as it has many one stud connections. The overall construction is less the sturdy, lacking in overlapping elements to lock things in place. 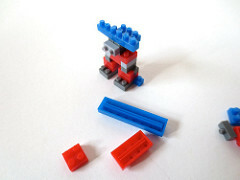 If micro bricks are your thing, TICO Mini Bricks are an affordable alternative to the pricier Nanoblock. According to their website, TICO appears to have licensed sets for Totoro, Angry Birds and One Piece, which are all very popular in Taiwan. 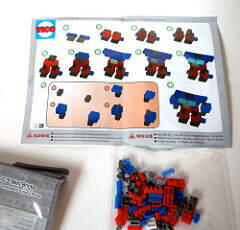 The characteristics of the bricks and the instructions sound exactly like Nanoblock. However, looking at the catalog on their website, their designs leave a lot to be desired. In fact, some are hilariously bad! The totoro and penguin are just plain scary, while the AK-47 and CRUCIFIXION sets are downright bizarre. 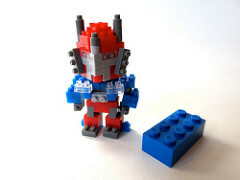 This one looks like a Cude Dude Optimus Prime.